BASIL (1950) The 28 ton 47 foot steel oil screw Basil stranded and was lost September 7, 1950 on the beach at Cape Lisburne. BAYCHIMO (1931) The trading supply steamer Baychimo was caught in the ice and abandoned in the Arctic Ocean in the fall of 1931. One report was that she drifted for 52 months along with the arctic ice pack until she finally disappeared in 1934. Others have the Baychimo sighted as late as 1969. She is often referred to as the “Ghost Ship of the Arctic”. BOWHEAD (1884) The 533 ton steam whaling bark Bowhead was lost on August 11, 1884 at Blossom Shoals near Icy Cape. She had departed San Francisco December 16, 1883 bound for a whaling voyage in the Arctic. The crew had made the Bowhead fast to ground ice to clean her boilers when she was struck and holed by a piece of drifting ice. She sank quickly. The crew was rescued by the vessels Narwhal and Balaena nearby. Some of the cargo of whale oil, bone and whaling station supplies was salvaged but the Bowhead, said to be worth more than $100,000, was lost. Is there any information on the Sealing Schooner “Bessie Rueter”? Records I have found report that it went down with all hands in the Chukchi Sea on Oct. 6, 1892. My Great Uncle, Walter E. Handy was a crew member. That’s about all I have been able to glean so far. He was from Marion, Massachusetts. The Bessie Rueter is listed in the Unknown section as a 31 ton schooner lost with all hands in Alaskan Waters. 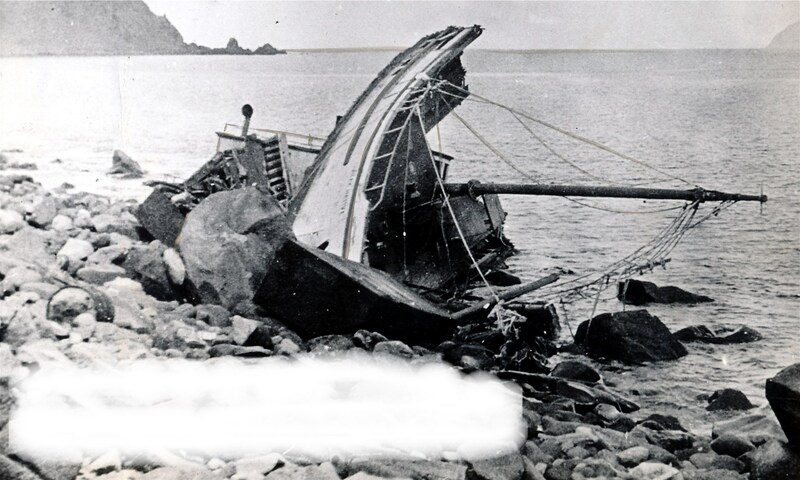 My information came from a list called Shipwrecks of the Alaskan Shelf and Shore published in 1992. I believe that information came from a shipwreck book by J Gibbs called Windjammers of the Pacific Rim from 1987. You mentioned October 6, 1892 and the Chukchi Sea which I cross referenced and the 324 ton whaling bark Helen Mar went down then (Oct 6, 1892) and there (Chukchi Sea) with the loss of most of its crew (35). What is most interesting is the First Mate’s name was listed as W E Hardy. This information can be found in Lewis and Dryden’s Marine History of the Pacific Northwest published in 1895 but available online for download. The story of the demise of W E Hardy and the Helen Mar is at the top of page 406.